This card was fun to make I used only my imagine. Cartridges used were create a critter and blossom imagine colors and patterns. Printed the base in brown, the layer with his spikes is a darker pink, the layer for his belly is a green pattern, and top is pink pattern. The green pattern mat was printed as well, and the pink pattern as well. 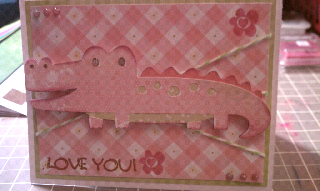 This ended up being a very pink and girly card and match me perfectly. 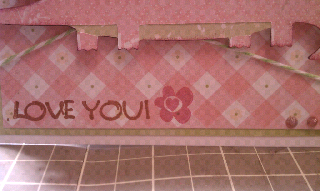 I also used a studio g stamp for the love you. And some twine from my minds eye in "fly a kite". I added some milled lavender stickles as well. 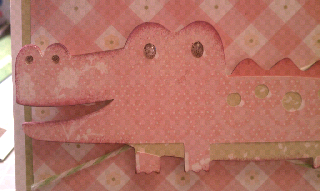 Oh I inked the crocodile with some pink chalk ink.